The BC Supreme Court decision against the re-zoning and land swap for a new condo tower beside Emery Barnes Park in New Yaletown has lots of people talking (again). There’s plenty to discuss about the lack of fairness, meaningful communication and transparency with Vancouver’s Vision-dominated City Hall, which seems to be joined at the hip to developers. The new development will bring an increase in affordable housing units only if you’ve drunk the Kool-Aid. Ever since Vision Vancouver changed the definition of affordable housing to include market rentals, “affordable housing” is just housing that somebody in this galaxy can afford. The 36-storey project — five times denser and four times higher than what was previously allowed under the City’s community development plan! 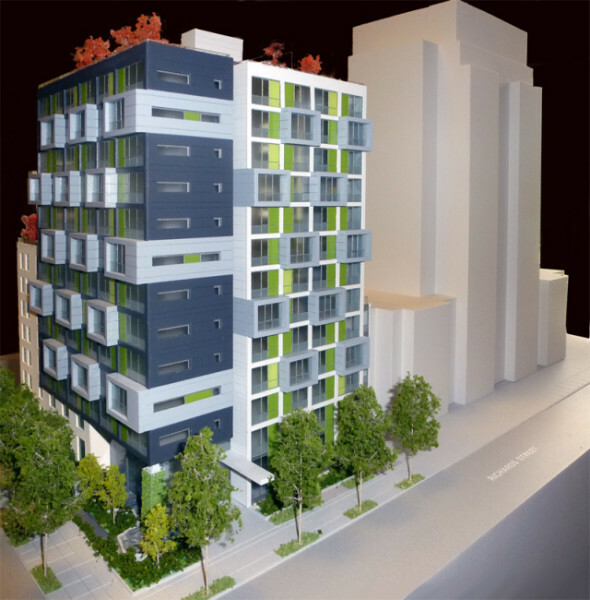 — involved a controversial City/developer land swap and a sad excuse for a public hearing. It frustrates me that New Yaletown residents, who brought the case to trial, have been charged with NIMBYism — supposedly because the condo project has more social housing units than the city-owned Jubilee House social housing project, which sits on the property formerly owned by the City that the developers got in the land swap. The “increased social housing” argument was also used by the City to help justify the project in the first place. But both arguments hold no water — there’s really no increase in the number of social housing units slated for the new project. I hate to sound like a broken record, but when you look at the number of so-called “affordable housing” units in the new project, it’s only greater because it includes all the units the developer can offer as market rentals. Ever since Vision Vancouver changed the definition of affordable housing to include rental housing, affordable housing is just housing that somebody in this galaxy can afford. Deals like this one, which was never put out to tender because the City claimed that it didn’t have to — wrongfully, as Justice McEwan pointed out — serve as a bitter illustration on why the City is required to tender its properties. When you tender you get the best value for your money. When you don’t, you don’t. What if another developer had been prepared to offer a better deal with more social housing or other benefits? That’s a good question. But one thing there’s no question about is what a good job the residents’ lawyer, Nathalie Baker, did. The case never would have succeeded without a capable lawyer who knows this stuff inside out, and who was prepared to spend an enormous amount of time arguing in court. Its unfortunate that the current residents of Jubilee House will now have to wait for much-needed new housing. But, overall, this is a major defeat of a flawed deal, and a victory — for the neighbourhood, for advocates of real affordable housing, and for the taxpayer. The full judgement is available here [PDF]. Great work by Nathalie Baker. What I see here is a $47,000,000 white coller crime. Shouldn’t this be police investigation now ? I mean, how can a property valued by the COV be $16M one year , then the next year has a $47m discrepancy ???? That to me is back room embezelment. A full legal investigation is needed . Can I call the police and report this crime ?